Read all the articles about Empyreal: Spells and Steam here. 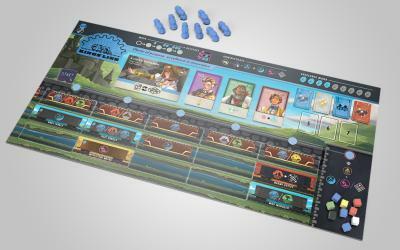 A preview of the very large (20x10") player boards, taken from one of the pages of the (work-in-progress) rulebook. 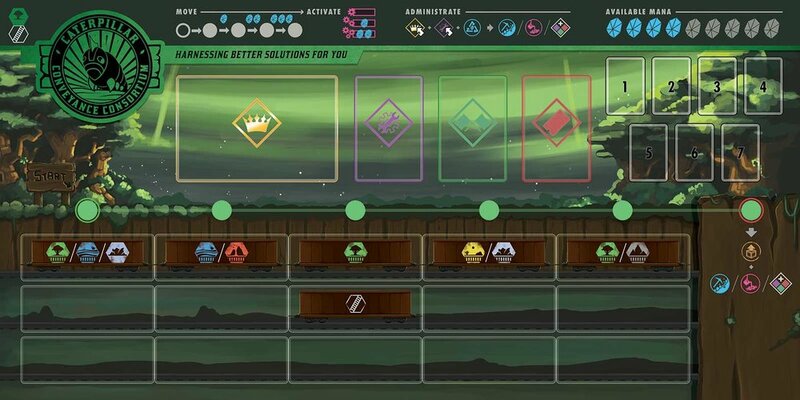 Here's a setup of a typical player board mid-game! In the game, players will be building up a railway company by hiring specialists, developing new engine technologies, and improving their economies. Spread your line around the board and acquire various goods to deliver to cities around the world. Each turn, you will be able to move your Conductor forward through your railyard, activating any cars that it lands on. When you reach the end of the line, you'll be able to make a delivery and perform upgrades. Upgrade your yard with more cars to take more actions every turn and outpace the competition! Each company has their own specialties and abilities. Your company's captain will also give you a unique edge! Kings' Line is excellent at building on Lake-type terrain, and can generate mana more efficiently than other companies. The brainchild of Runika Zenanen, former royal armiger of Jeffreys, is a modern steam engine driven by ancient golem technomancy. The trains of the Kings' Line are especially mana-efficient, providing this company with extra resources to expand and operate. Caterpillar Conveyance is strong for building in forests, but generally excellent at all terrain types. Marcinae can 'feed' resources from the board to her Caterpillars to make them range further. Founded by dryads of the great forest Kashai-In, the Caterpillar Conveyance Consortium uses organic "trains" to pack huge amounts of cargo over sprawling rail lines. Since their caterpillars need no set path, they can quickly branch their networks across the land to connect distant areas. The Afterworld Express builds most effectively upon icy terrain. They are capable of pulling resources from adjacent areas into their network, allowing them to make larger deliveries. 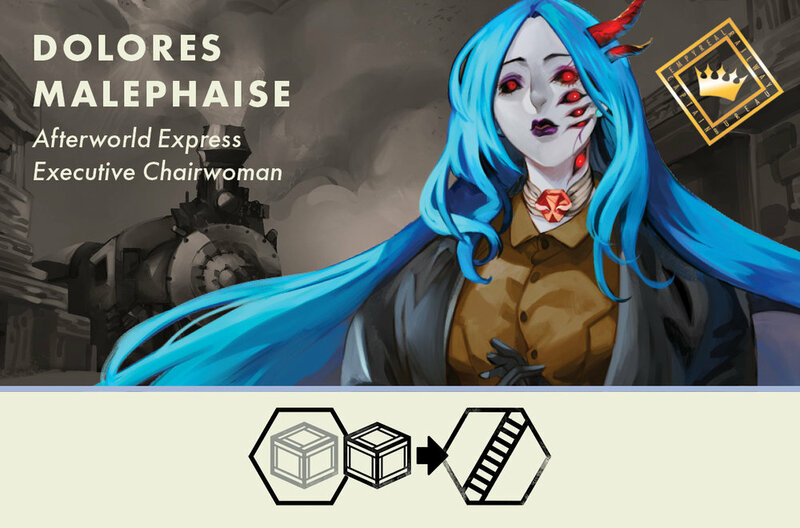 Built by the daemon Dolores Malephaise to harvest the souls of the dead from across the world, the Afterworld Express has recently taken to accepting cargo and passengers as well. Their extensive networks allow them to draw in resources from areas surrounding their trains. Spoooooooky. I'll be back next week with previews of the remaining 3 companies! See you then!